Geneva/Nairobi/New York,3 March 2017, World Wildlife Day – Figures released today by the CITES MIKE Programme (Monitoring the Illegal Killing of Elephants) on the 2016 trends in the poaching of African elephants show that the steady increase in the levels of illegal killing of elephants witnessed since 2006, and peaking in 2011, has been halted and stabilised but at levels that remain unacceptably high overall. 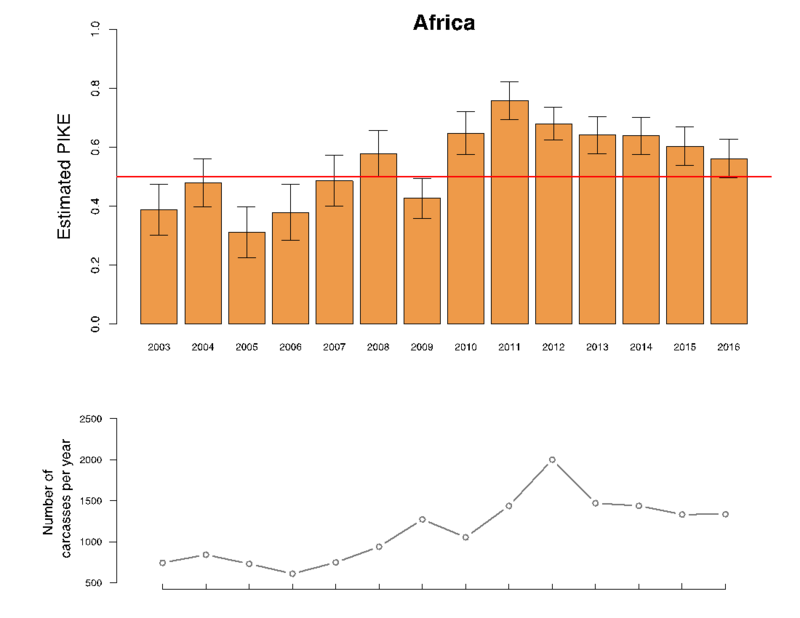 Despite the slight decline continuing to be witnessed, with stabilisation recorded since 2011, estimated poaching rates overall remain higher than the normal growth rate of elephant populations, or above the sustainability threshold, meaning the elephant population overall is likely to have continued to decline in 2016. High levels of poaching were again recorded in Central and West Africa. Overall poaching levels in Southern Africa continue to remain below the threshold. Particularly, poaching levels are high in Garamba (Democratic Republic of Congo), Gourma (Mali), Odzala-Koukoua (Republic of Congo) and Niassa (Mozambique). From recent reports in the media, the poaching level has increased in or near Minkèbè National Park (Gabon) but official records have not yet been received from Gabon for 2015 and 2016. "African elephant populations continue to face an immediate threat to their survival from unacceptably high-levels of poaching for their ivory, especially in Central and West Africa where high levels of poaching are still evident. Encouraging signs are however visible in Eastern Africa, in places such as Tsavo in Kenya, where the overall poaching trends have declined to pre-2008 levels. This shows us all what is possible through a sustained and collective front-line effort coupled with strong political support” said John E. Scanlon, CITES Secretary-General. At the 17th meeting of the Conference of the Parties to CITES (CoP17), held in Johannesburg in September/October 2016, the CITES Secretariat was asked to work with its partners in the delivery of activities that focus wildlife crime enforcement support on countries in Central and West Africa. See decisions 17.97-17.100. Decisions were also taken at CoP17 on the CITES National Ivory Action Plans (NIAPs) process (Decisions 17.70 to 17.82), addressing the entire illegal supply chain for elephant ivory (elaborated upon below). CITES Parties have been quick to implement the decision taken at CoP17 on the closure of domestic markets (Resolution Conf. 10.10 (Rev. CoP17), with China announcing on 30 December 2016 that it would close down all ivory carving factories and retail outlets by the end of 2017, some of which will be shut down by 31 March. The CITES Secretary General will make an official visit to China at the end of March to meet the relevant government agencies and to observe the progress. CITES has identified 27 countries that are most heavily implicated in the illegal trade in ivory. These are categorized as countries of ‘primary concern’ (nine countries and territories), ‘secondary concern’ (nine countries) and ‘importance to watch’ (nine countries). The CITES Standing Committee considered the progress made by 19 Parties requested to develop and implement National Ivory Action Plans (NIAPs) at its 66th and 67th meetings held in Geneva in January 2016 and in Johannesburg in September 2016, respectively. The Committee agreed that China (including Hong Kong SAR of China), Kenya, the Philippines, Thailand and Viet Nam, all countries of ‘primary concern’, have 'substantially achieved' the implementation of the activities outlined in their NIAPs and commended these countries for the progress made. The Standing Committee agreed that Malaysia, Uganda and the United Republic of Tanzania as countries of ‘primary concern’ have not yet 'substantially achieved' their NIAPs and these countries, together with Cameroon, Congo, the Democratic Republic of the Congo, Egypt, Ethiopia, Gabon, Mozambique and Nigeria, as Parties of ‘secondary concern', and Angola, Cambodia and the Lao People’s Democratic Republic, as Parties of ‘importance to watch’, were directed to enhance their efforts with NIAP implementation, and to further report on their progress at the 69th meeting of the Standing Committee in December 2017 in Geneva. In preparation of the 17th meeting of the Conference of the Parties (CoP17), held in Johannesburg in October 2016, CITES identified, once again, Parties for inclusion in the NIAP process from among the 27 Parties most heavily implicated in illegal ivory trade. In addition to the 19 Parties that were already participating in the NIAP process, the Standing Committee over the coming months will decide on whether Malawi, Singapore and Togo, identified as new Parties of ‘primary concern’, Sri Lanka and South Africa as new Parties of ‘secondary concern’, and Japan, Qatar and the United Arab Emirates as Parties of ‘importance to watch’, will be invited to participate in the NIAP process. “The momentum generated over the past few years is continuing to translate into deeper and stronger efforts to fight these crimes on the front line, where it is needed most – from the rangers in the field, to police and customs at ports of entry and exit and across illicit markets. These front line efforts must be further enhanced if we are to move from stabilising to reversing the devastating poaching trends of the past decade. On this World Wildlife Day we reach out to everyone to play their part in this collective endeavour” added Scanlon. With 183 Parties, the Convention on International Trade in Endangered Species of Wild Fauna and Flora (CITES) remains one of the world's most powerful tools for wildlife conservation through the regulation of trade. Thousands of species are internationally traded and used by people in their daily lives for food, health care, housing, tourist souvenirs, cosmetics or fashion. CITES regulates international trade in over 35,000 species of plants and animals, including their products and derivatives, to ensure their survival in the wild with benefits for the livelihoods of local people and the global environment. The CITES permit system seeks to ensure that international trade in listed species is sustainable, legal and traceable. CITES was signed in Washington D.C. on 3 March 1973 and entered into force on 1 July 1975.